This article and interview was originally published on the Sydney Criminal Lawyers website and can be read here. West Papuan independence activist Yanto Awerkion is set to stand trial on charges of treason in Timika District Court tomorrow. 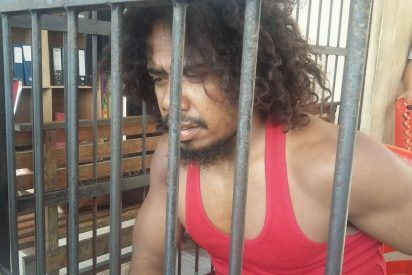 Mr Awerkion was due to go before the court in West Papua last Tuesday, but the trial was postponed, as the judge failed to attend. Mr Awerkion’s only crime was to address a peaceful prayer meeting in the town of Timika. On May 30 last year, Yanto took to the stage and announced to the crowd that a self-determination petition had garnered 267,437 signatures in the local region of Bomberai. Moments later, Indonesian authorities arrested Mr Awerkion, the deputy chair of the Timika branch of the West Papua National Committee (KNPB). Under the oppressive rule of the Indonesian regime, the 27-year-old is facing up to 15 years behind bars. Over its 55 years of occupying the territory, Jakarta has consistently kept a harsh clampdown on dissent. On September 26 last year, West Papuan independence leader Benny Wenda presented the petition to the UN Special Committee on Decolonisation (C24). The document calls for an internationally supervised vote on West Papuan self-determination. The petition was signed by 1.8 million West Papuan people, which accounts for 70 percent of the Indigenous population. Those who signed the petition risked their freedom, and indeed, their lives to take such a stand. Indonesian authorities banned the petition, and threatened those who signed it with imprisonment. And after its presentation to the C24, the Widodo government then claimed it was a hoax, which raises the question as to how Awerkion can be charged with treason for supporting a fake petition. The Indonesian government began its occupation of West Papua in 1963. This was done under the provisions of the 1962 New York Agreement, which resulted in the United Nations initially assuming administration of the territory, after former coloniser the Netherlands left. The agreement also provided that a referendum be held to give the West Papuan people a choice between remaining part of Indonesia, or becoming an independent nation. Following widespread resistance to the rule of Jakarta, the UN brokered Act of Free Choice referendum was held in 1969. However, the Indonesian military selected only 1,062 West Papuan representatives to vote, and under threat, all of them elected to stay with Indonesia. Since the occupation began, an estimated 500,000 locals have lost their lives under brutal military and police repression. Over recent days, hundreds of people from around the globe have been phoning Timika authorities and calling for Yanto’s release. This kind of support has resulted in lighter sentences, and better treatment within the prison system, for West Papuan political prisoners in the past. Sydney Criminal Lawyers spoke to Free West Papua campaign spokesperson Raki Ap about the conditions that Mr Awerkion is facing, the question around charging an individual with treason over a petition that Indonesian authorities claim is a hoax, and freedom for Yanto and West Papua. Firstly, Mr Ap, Yanto Awerkion has been held behind bars for close to 8 months now. What sort of conditions has he been held in? And how is his health and mental well-being holding up? Yanto Awerkion has been held in poor conditions. 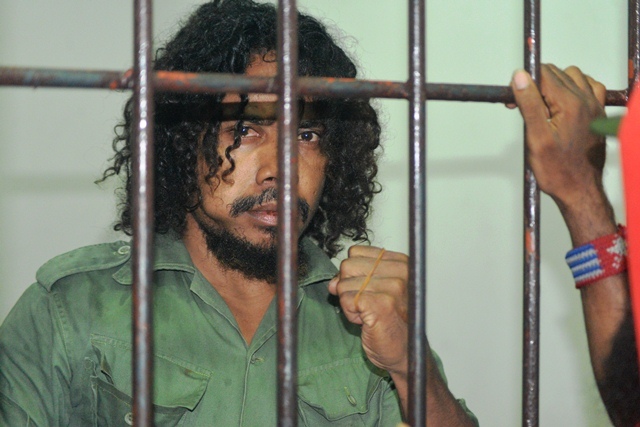 He was originally held in the Indonesian police station in Timika and now is being held at the Timika prison. He was held for over 5 months before his first court appearance late last year. Physically, Yanto’s health has been seriously deteriorating. He is being given two meals per day and is experiencing headaches, fevers and respiratory disorders. But mentally, he is strong and just as determined as ever to continue to struggle for West Papua’s fundamental right to self-determination. Yanto Awerkion has never stopped campaigning for West Papua’s right to be free. Mr Awerkion was arrested last May, after he announced the large numbers of signatures that had been collected for the self-determination petition at a prayer meeting. What actually happened after Mr Awerkion took to the stage? After Yanto Awerkion took to the stage, the Indonesian military, police, special forces and intelligence services stormed the compound of the West Papua National Committee, which had organised the gathering. They broke down the gate and raided the KNPB office, confiscating all that they could and acted aggressively towards West Papuans. Meanwhile, West Papuan people simply sat on the ground signing hymns. When the Indonesian security forces found Yanto, they immediately arrested him and took him to the Indonesian police station. The Indonesian government claimed the self-determination petition was a hoax. So, I’d like to ask, in your opinion, how can a government that officially calls a petition a hoax, arrest a person and charge them with treason, when he’s supporting what they claim is a fake? That is a very good question. The answer is, the same way the same government which officially claims to be representing the people of West Papua, continues to orchestrate the ongoing slow-motion genocide of West Papuan people, and the deaths of over 500,000 West Papuans. I hope that the Indonesian government will also respond to this question. It is another example of how their own actions illustrate the fraudulence and illegality behind their occupation of West Papua. Unfortunately, Mr Awerkion is only one of many West Papuan political prisoners being held behind bars by the Indonesian government at present. How many West Papuan political prisoners are there? It’s difficult to say. At the end of 2016, there were at least 37 political prisoners. Human Rights Watch estimates that there are at least five political prisoners still in West Papua, but the exact number is unknown as the Indonesian government has refused to provide Human Rights Watch with an official total. We believe there may be many more. And what is life like for them on the inside? Life for political prisoners is hardly life at all. West Papuans behind bars are treated like animals by the Indonesian authorities. They are denied all human rights, are racially abused, and are regularly tortured. West Papuan political prisoners endure the Indonesian state’s harshest discrimination and brutality. It is a testament to their courage that even behind bars, they continue to campaign for West Papua to be free. Many West Papuan people call Indonesian prisons “little prisons” and West Papua itself, the “big prison”. The Indonesian government has been occupying West Papua for around 55 years now. What is life like on the ground today for West Papuan people living in their own land? Today, in West Papua, people have their fundamental rights trampled on a daily basis. Nearly everywhere you go, you can see Indonesian military posts and checkpoints every few kilometres. They regularly stop and search people, including mothers and children, and confiscate their belongings at gunpoint. For people living in West Papua, it is life under the barrel of a gun. If you are a West Papuan person in the wrong place at the wrong time, you can simply be killed and there will be no investigation into your death. In the eyes of the Indonesian authorities, our lives are worthless. We are seen as barely human. Our people are not free to be who they are. The Indonesian Security Forces want to do all they can to suppress West Papuan identity, anything that shows we are not Indonesian. My own father, Arnold Ap was killed by the Indonesian Special Forces just for singing freedom songs. There has been no investigation into his murder. If you want to know what life is like for West Papuan people on the ground, it’s also a good idea to ask our mothers who give birth to children, only to watch them be killed by the Indonesian military. The Indonesian government wants to wipe out every generation of West Papuans. They don’t want our cries for freedom to be heard by the outside world. But the reality is that our cries for freedom are only getting louder. The West Papuan People’s Petition has provided hope to all generations inside the country, and bolstered our collective efforts to liberate West Papua once and for all. The West Papuan People’s Petition was an enormous feat. However, the UN Special Committee on Decolonisation rejected it. They stated it was out of their mandate, which Benny Wenda said was to be expected. What are the plans for the petition in the future? We know that the Indonesian government will do everything they can to try and stop this petition. The government are still looking for people inside West Papua who were involved with helping to organise it. We cannot share details at this time, but we would really like to encourage people to read about how 1.8 million people inside West Papua managed to mobilise themselves to sign it despite threats of arrest, torture, and worse. They risked everything to have their voices heard, and we would like to make sure that the world hears them. And lastly, Mr Awerkion is set to stand trial on Thursday. How are his supporters at the Free West Papua campaign feeling at this moment? We are hoping and praying that Yanto is being treated well. That the attention his trial is making globally will get people to hear and care about all the people of West Papua. And that freedom for Yanto, other political prisoners, and for West Papua will come soon. Mr Ap thank you very much for taking the time out to have this chat with us today. My pleasure Paul, thank you very much. Rather than sharing Christmas with his family, West Papuan political prisoner Yanto Awerkion will be spending Christmas day in a prison cell in West Papua – all for signing a petition…. We’re doing all we can to help get him out, but we need your support!